Eighty-year-old Ed Cyr used a snowblower to clear his driveway at his Bangor home in this photo from March 2017. 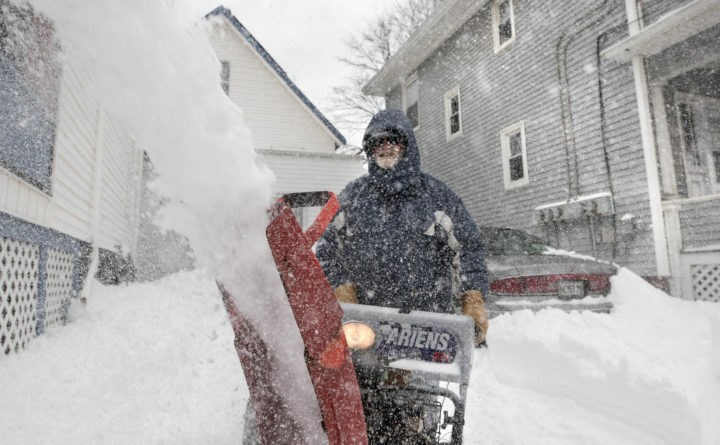 Maine weather is expected to turn brutally cold this week, and Mainers of all ages are advised to take precautions against frostbite, hypothermia and other cold-related conditions. Mainers are a hardy breed, but the extremely cold weather expected in the next few days puts even the strongest at risk. According to the National Weather Service, daytime temperatures in the Bangor area and the northern half of the state will stay in the single digits throughout the rest of the week and into the weekend, dipping overnight from zero to 20 below. An overnight windchill advisory in northern Maine on Tuesday night into Wednesday morning means effective temperatures as low as 30 below zero in some areas. Mainers in more southerly areas of the state also will see frigid temperatures this week. Cold weather is nothing new here, but especially for frail older Mainers and the very young, it poses significant health risks. Maine’s drafty older homes and mobile homes can be surprisingly chilly, especially when thermostats are set low to conserve fuel. Even robust adults who work or recreate outside in cold temperatures can suffer from potentially serious conditions such as frostbite and hypothermia. Frostbite occurs when the skin and underlying tissues are exposed to extreme cold long enough to freeze. It is most common in fingers, toes, nose, ears, cheeks and chin — body parts often inadequately protected from the cold. Signs of frostbite include a sensation of cold followed by prickling and numbness. Skin turns red, then loses color and takes on a waxy look. In its early stages, frostbite may be reversed with gentle warming, but serious cases may lead to permanent nerve damage, infection and amputation. Hypothermia is a medical emergency that occurs when the body’s core temperature drops to a dangerously low level. Prolonged exposure to extreme cold is often the cause, but even cool or drafty indoor temperatures can cause this dangerous condition, especially in elderly or very young people whose bodies may be unable to regulate their temperature effectively. Danger signs include uncontrolled shivering, slurred speech, lethargy and mental confusion. Both hypothermia and frostbite are dangerous conditions that require prompt medical attention. Fortunately, both can be prevented by taking some common-sense precautions. Here are some tips from the U.S. Centers for Disease Control and Prevention for keeping warm and safe during this frigid week and throughout Maine’s long, cold winter. — Dress appropriately. Indoors and out, loose layers help hold body heat close. Start with a layer of long underwear and build out from there. Outdoors, cover your face and head with a hat and scarf or a winter facemask, and include thin socks and gloves under heavier ones. A long coat or parka provides better protection than a short jacket. Warm, waterproof boots should have a grippy tread. Indoors, a light cap or headscarf will warm your head while fingerless mitts keep hands toasty. A sweater or vest is appropriate in all but the very warmest homes. — Consume plenty of warm fluids, such as tea or soup, and eat protein, whole grains and vegetables for balanced nutrition. A healthy, well-hydrated body is more able to maintain its core temperature and circulation. — Exercise moderately to stimulate blood flow to all areas of the body. A brisk walk or other outside activity can be invigorating for some people, but others may be better off with an indoor session of gentle stretching, home treadmill or stair-climbing. Dress for warmth but avoid overheating. — Avoid drinking alcohol. Although a nip may produce a brief warm glow, the overall effect is to speed the loss of body heat. — Provide adequate bed coverings, including layers of light blankets and comforters. An electric blanket or heating pad on a low setting can be a welcome addition for adults, but monitor carefully for overheating. During the day, use a lap blanket to keep feet and legs warm. — Always use extreme caution with space heaters, wood burning stoves and other heat sources, making sure they are not close to combustible surfaces and that they are monitored appropriately to avoid fire hazards, burns or other accidents. It’s especially important to keep an eye on vulnerable family, friends and neighbors during this very cold weather. Make a daily phone call, drop by with a pot of soup or a thermos of tea or open your guest room for a few days. Many Maine communities also provide warm gathering spots with hot meals and family activities at churches, schools, community centers and other sites. More information may be obtained through your town office or by calling the statewide 2-1-1 referral hotline.